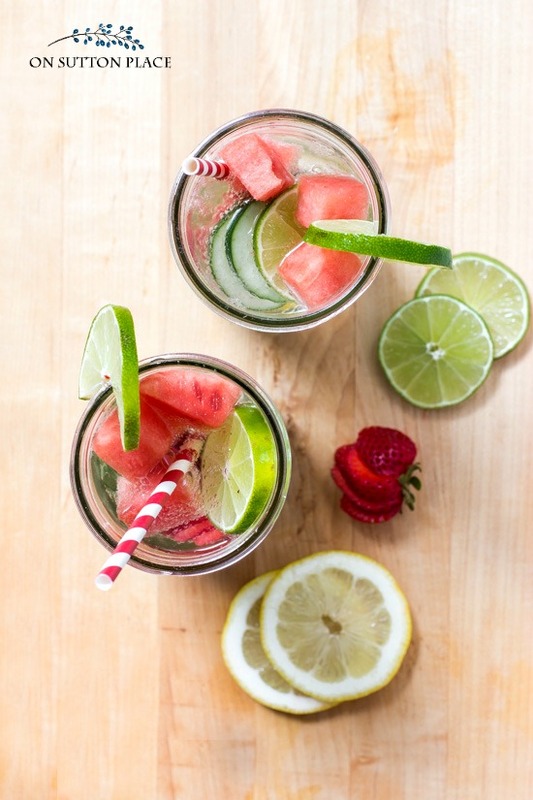 Easy and refreshing fruit infused water recipe. Make drinking water fun, nutritious and colorful! 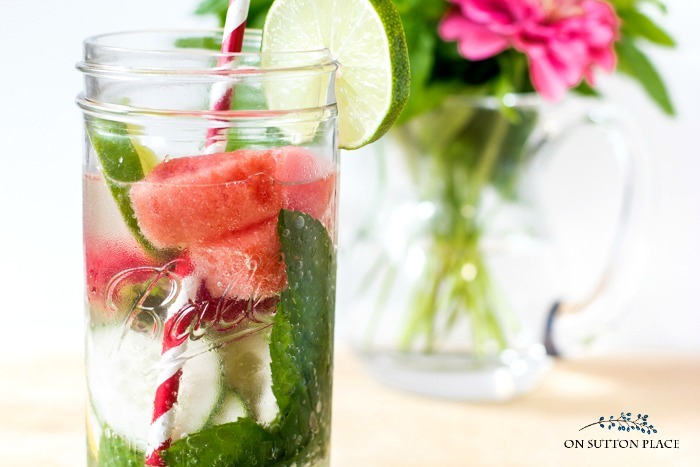 Make this infused water in mason jars and always have it on hand. One of the reasons I enjoy growing mint in my herb garden is because I love to use it in drinks. I add it to lemonade, orange juice, and even plain water. To jazz up the water even more, I infuse it with not only mint but fruits and vegetables as well. This fruit infused water recipe is just a guideline…you can use your favorite fruits/veggies or simply use whatever you have on hand. I like the citrus combined with the sweet strawberries & watermelon. Cucumber is optional. Sometimes I add it and sometimes I don’t. *This post contains affiliate links. Click HERE for my complete disclosure. Ingredients for two jars: use quart size wide mouth canning jars. Cut 4 slices out of the middle of the lemon and lime. Squeeze the juice from the ends of the lemon and lime over the mint. 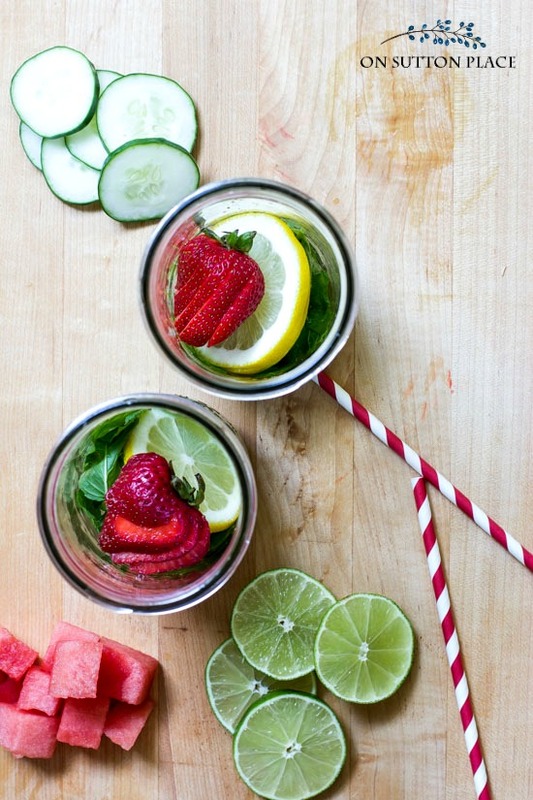 To each jar add: 2 lemon slices, 2 lime slices, half the strawberries, 5 watermelon chunks and 4 slices of cucumber. Screw on the caps and shake. Refrigerate at least 2 hours. Pour the infused water in a drinking glass over ice. If I finish a jar of infused water and the fruit is less than a day old, I refill the jar and use the fixings again. After two times, the fruit and mint lose their taste. One more tip: I harvest at least 15 stems of mint at a time. I strip the leaves from the bottom three inches of each stem. I give them all a fresh snip on the ends and put them in a little pitcher of water that I keep on my kitchen island. Whenever I want mint, it’s right there ready to use. Store-bought mint from the grocery can be stored this way as well. I would love to get back into some sort of routine because for some reason, whatever routine I had has gone right out the window. I guess that’s what summers are for though…so I’m not going to worry about it too much. Thank you for stopping by…see you soon! No spam…unsubscribe at any time. 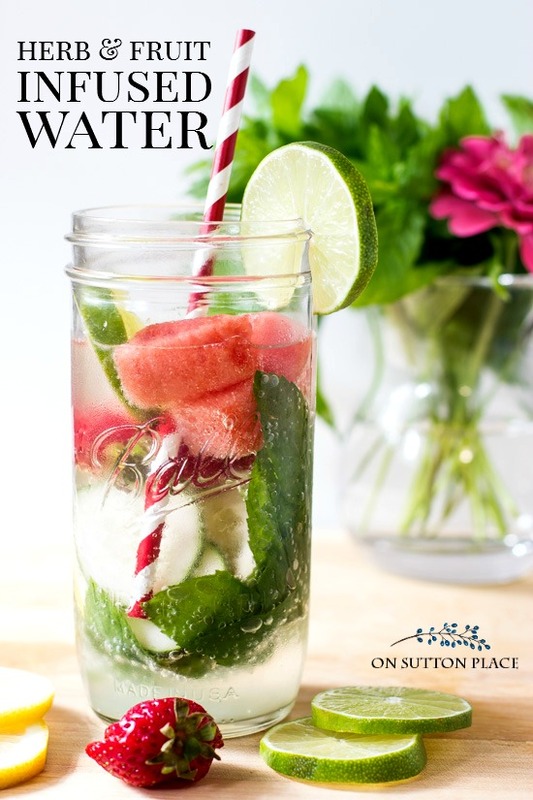 Current subscribers can find this printable Fruit Infused Water Recipe in the Member’s Only Library! I love the candle ideas! I am definitely going to give it try! Love your recipe!!! I use fruit in my all the time . It makes drinking water so much better and enjoyable….. This look amazing! Making a trip to the store today!!! I have been wanting to try making infused water, and this post was a good reminder. Thank you for the easy instructions. Yours looks so refreshing! 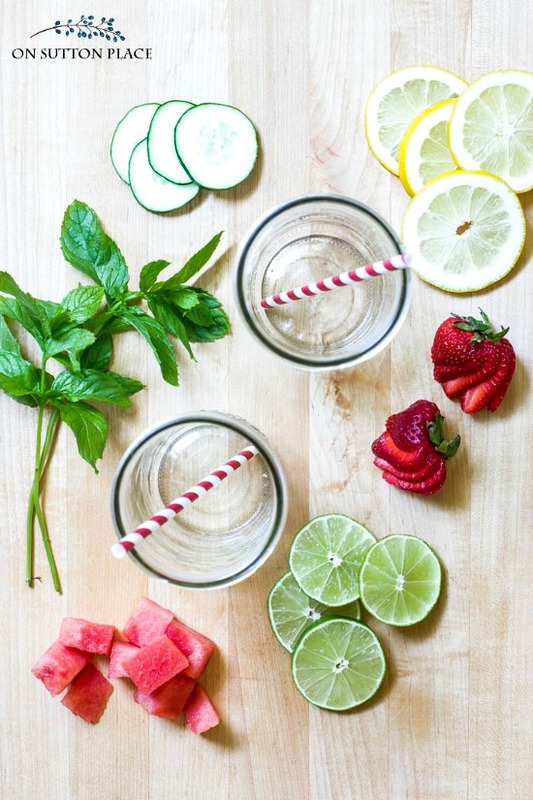 Love the infused waters! What a treat to enjoy on the porch on a summer day! Very pretty as well!